Summary : Vordak the Incomprehensible Book Review. One of the funnier and creative books series on the market today! Vordak the Incomprehensible is unique and a hysterical read for kids. Scott Seegert’s master use of alliteration and plotting to take over the planet has this book hitting the Must Read Book List. 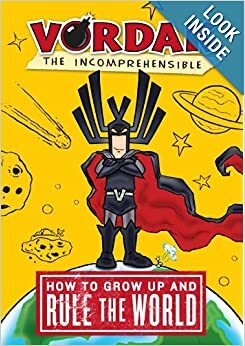 I defy you to read the first two chapters (Vordak the Incomprehensible: How to Grow Up and Rule the World Preview ) and not laugh out loud. Hands down a book series made for reluctant readers age 11 to 14. I’m a huge fan. I’m sure Vordak would feel the “Must Read” list is unworthy to pen his name, for that Vordak, I’m sorry! Muahahahaha! This middle grade graphic novel is about the supervillan Vordak who is on a mission to take over the world. Vordak always comes up with “diabolical” plans but are always foiled by his enemy Commander Virtue. The humor is quick hitting and the graphics are excellent, making any reluctant reader a fan. Vordak The Incomprehensible is a great read and should be in every middle school students’ hands. The humor is light making this an easy read and Vordak is a hilariously villainous throughout. But this book does contain some language and makes fun of “goody tissues”. But other than some inappropriate jokes, Vordak is toe to toe with any middle grade book. Teacher, mom and passionate about finding the next best must read book for kids. This really is considered one of undoubtedly one of the best story. I genuinely enjoy searching at on this website , it has great content . Wow, it’s no surprise why you’ve so many people following you online.